“Bauhouse” – Ensembles – Download – Symphony. 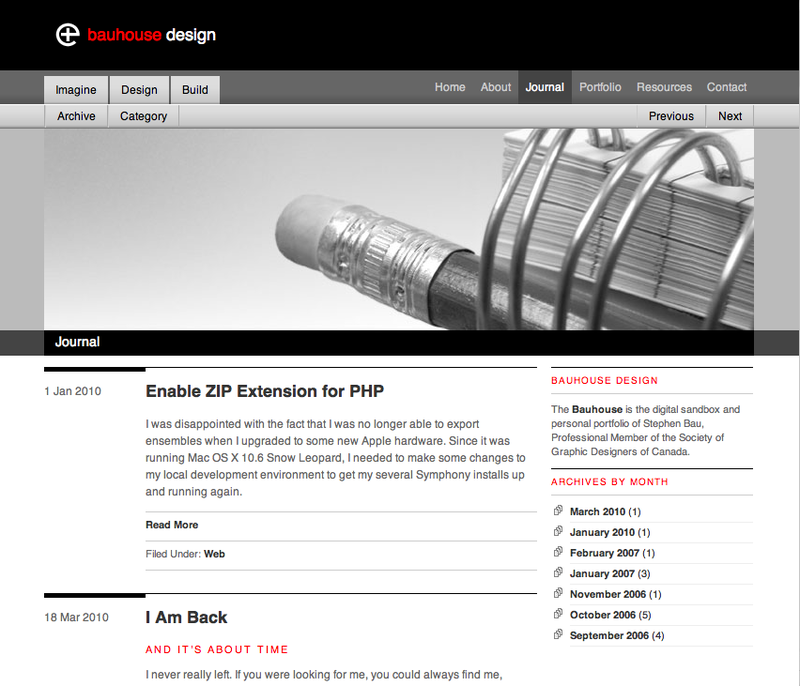 The Bauhouse Ensemble is a blog portfolio ensemble that is based on a design I created a few years ago. I am releasing this design as an ensemble based on the interest expressed in this thread. The current implementation of the portfolio involves a very manual process of building five different images for each piece because of the way I’ve implemented it. I developed this probably about three or four years ago when I was first starting out with Symphony. So, it was more a test of what Symphony was capable of than the best way to approach managing a portfolio site. I’m open to suggestions on how this should be improved. I never got around to implementing comments and gravatars, but this could be added, based on the implementation in the Forum Ensemble, similar to the way this site is working. Note that I have removed photography from the site. I have included screenshots that I made of earlier versions of Symphony, when I first started writing tutorials for Symphony. This information may have some relevance, but just be aware that many things have changed in the years since I first wrote the tutorials, at the time of version 1.5, I believe. Install the ensemble as you would normally install Symphony by pointing your web browser at http://yourwebsite.com/install.php and provide details for establishing a database connection and about your server environment. Be sure to have an empty database ready for Symphony (or use a different table prefix). Navigate to the root of the install and provide your preferences, server configuration details and primary user information and click the “Install” button to install Symphony 2 and the Bauhouse ensemble. Secure the site by changing permissions for the root and symphony directories. Enjoy seeing the world in black, white, grey and a touch of red!